Putting text into an Inkscape drawing is as easy as it is in any word processing application. Just click on the Create and edit text objects tool in the Toolbox, click on the canvas where you want the text to appear, and in the text Tool Controls Bar select the font, font size, and font style (Normal, Italic, Bold) that you want. In Inkscape, text is both text, that is you can select the font and font properties, and an object. As an object you use the Select and transform objects tool to select and move the text and perform other operations similar to regular non-text objects. As an object, the most interesting thing you can do is set the Stroke and fill. This makes it very easy to create colored, outlined text. When selected as an object, you can click on it again to get the rotation handles and easily rotate the text to any angle you desire. Note that i said "click on it again" rather than double-click, because if you double-click on text selected with the Select and transform objects tool, the text will change to the font, font properties, and type entry mode. You can also return to the font, font properties, and type entry mode by selecting the text and clicking on the Create and edit text objects tool. If you click again on text selected with the Select and transform objects tool, to get the rotation handles and you rotate the object, it might seem a little weird while using the arrow keys to step through the characters of the text, and the backspace key to remove characters. For example if you rotate the text 180 degrees, the right-arrow key will move the insertion point left, and the backspace key will remove the character to the right of the insertion point. Similarly, if you flip the object horizontally, the right-arrow keys and the backspace key will appear to be working backwards. I'm not complaining, this is what you would want. And if you enter more characters with the text flipped, they will be inserted to the right of the insertion point, and they will have all the properties (stroke style and fill color) that you set for the rest of the text. 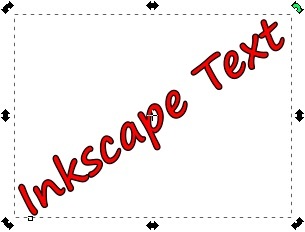 This article just touches on the basics of using text in Inkscape. Through the use of gradients, filters, and textured fills, what you can do with text in Inkscape is just about unlimited.